iStream is a free Windows 8 Videos App for enjoying a humongous variety of TV shows, News, various online videos on your computer screen. iStream provides you a huge library of online videos which is just one click away from your mouse button. This Windows 8 app will let you discover thousands of TV shows , News, and various online videos around the globe containing Indian content in various languages like Hindi, English, Telugu, Malayalam and Tamil. You can also enjoy some of the old classic movies and latest movie trailers from the Movies genre. 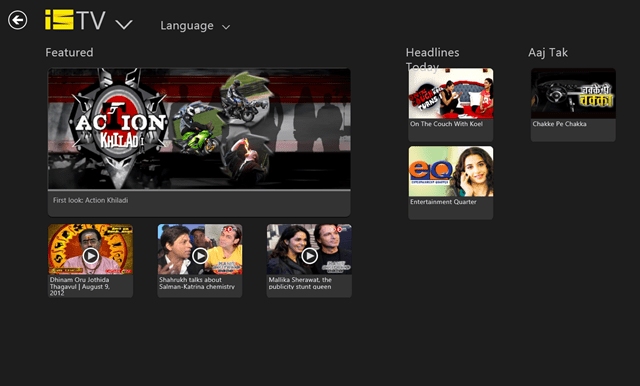 The Windows 8 videos app provides you a number of genres like Featured, Movies, News, Random TV shows etc. Just browse through this iStream app for Windows 8 and it will use your permission of Internet connection. Later, you can discover various random online videos all over the globe with Indian content in front of your naked eyes in any language you want and enjoy News, movies, online videos etc. May be a certain drawback could be that, it doesn’t give you much independence according to your demand as it streams video on your system but you can’t just use it for your own convenience as you don’t have much of a choice with you. But overall, it’s a nice Windows 8 videos app given under the “Entertainment” category of Windows 8 store.